Bettje van Esso-Kroon was born in Appingedam as daughter of Samuel Kroon and Frouke de Vries. The couple had eleven children. She married on 4 January 1881 in Appingedam to Abraham van Esso. He was born in Vollenhove as one of six children of Meijer Mozes van Esso and Vrouwke van Dam. 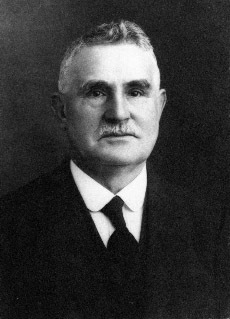 Bettje and Abraham had five children: Meijer (1882-1884), Samuel (1883-1943), Vroukje (1884-1943), Sientje (1887-1884), and a baby who died during birth. Abraham  nicknamed Bram de Soep  was one of the Van Esso’s who were in the silver trade. He had his first shop on Touwstraat, later on Grote Kerkstraat. Of all the ‘Silver Van Esso’s’ Abraham was the least wealthy. After the death of Abraham on 23 July 1923, Bettje and her daughter Sientje were left in Meppel. 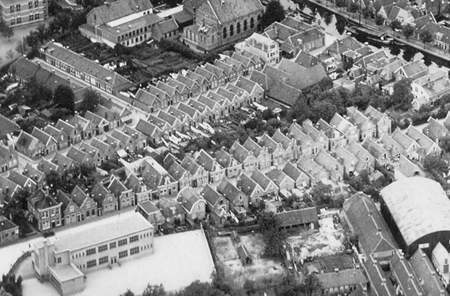 Sientje was unmarried and lived together with her mother on Emmastraat. Sientje was a talented actress; she and Mrs Worst-Maat, were the best actresses that Meppel ever had. 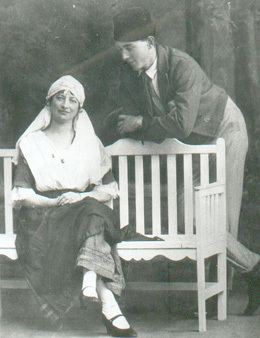 Sientje was a member of the theatre group TAVENU and played some unforgettable roles. Together with director Harm Plenter, and also under his direction, she played brilliantly. She acted in the plays Filmmaniakken (1927) and the Bruiloft (wedding) van Kloris and Roosje (1927). Harm Plenter stimulated cultural life in Meppel at the beginning of the 20th century. He was theatre director, writer of revues, platform speaker and actor. In the field of culture he found that Jewish girls had a little extra to offer compared to their non-Jewish colleagues and that they dominated their male colleagues in every respect. 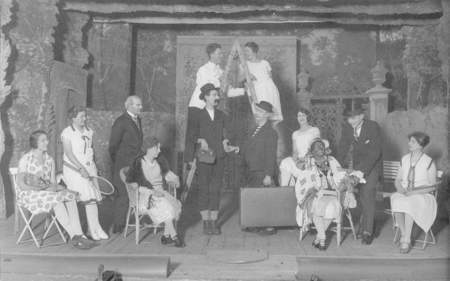 Sientje Van Esso (on the far right) during a performance of the play ‘Sonna’ by the theatre group Tavenu. Sientje van Esso during a performance of the play 'Klorus and Roosje' , together with Harm Plenter. At the beginning of the Second World War, mother and daughter Van Esso must have gone through a very quiet and lonely period. And as far as they would have felt the need for it, for Sientje’s cultural hobbies was of course no more place. Mother and daughter were taken out of their house on 3 October 1942 and transported to Westerbork, where they stayed together for a month. Bettje died on 2 November in camp Westerbork and was buried at the Jewish cemetery in Assen (ZO.4-29). She was 86 years old. Seintje stayed at Westerbork until 16 February 1943 and was then transported to Auschwitz. Three days after her arrival on 19 February she died. She was 56 years old. The ladies Van Esso had taken in a lodger, an older gentleman Hein Roos, father of at least ten children, one of them being Salomon Roos, a textile trader in Woldstraat. Despite his old age he would go to his son’s business every day and help to prepare and pack the merchandise. The farmers who came to the shop called him ‘Roos-Hein,’ and the neighbouring children would turn it into ‘Rozijn’ (raisin). 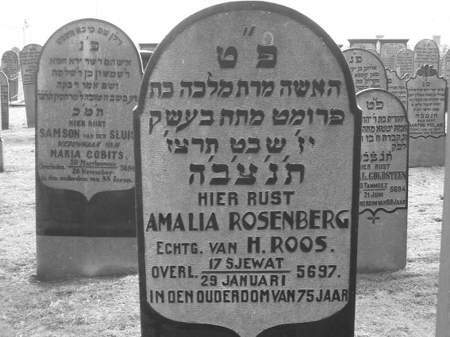 The gravestone of Amalia Roos-Rosenberg, the wife of Hein Roos. In your Identity card a ‘J’ has been printed correctly, as it appears from an extract from the registration form you filled up, that you were a member of the Jewish religious community, so that you must be considered a Jew. To issue a new Identity card without the ‘J’ is not possible. This was a death penalty as it appeared soon. He was deported and killed. Grandfather Hein (80 by now) died on 26 October 1942 in Auschwitz. Bettje and Hein leave empty spaces at the Jewish cemetery in Meppel where Abraham and Amalia are buried. They will remain for ‘always and ever’ separated from their spouses. right is where mother and daughter Van Esso and Hein Roos lived.